﻿ Reserve Power - Oldham Batteries Canada Inc.
Oldham Canada distributes the complete and extensive line of Reserve Power and Specialty Batteries manufactured by Enersys. These include thin plate pure lead, Absorded gas mat (AGM), flooded and VRLA technologies using flat plate or tubular batteries. 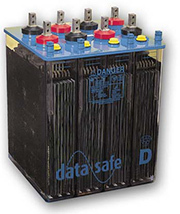 These batteries can be used in diverse applications such as emergency lighting, telecommunications, UPS systems, telephone systems, generating solar plants and hydro-electric plants. We offer integrated Services and Systems such as preventive maintenance, surveillance, field testing, technical reports, equipment analysis and capacity testing. Oldham administrates all Reserve power related activities under the ISO 9001:2008 quality-registered system. In order to earn ISO certification every year Oldham must demonstrate its ability to consistently provide a product that meets customer and applicable statutory and regulatory requirements. Oldham aims to enhance customer satisfaction through the effective application of the system, including processes for continual improvement of the system and the assurance of conformity to customer and applicable statutory and regulatory requirements. © 2014 Oldham Batteries Canada Inc.